What’s the dumbest thing you’ve heard this month? I’ve heard this massively irritating gripe – almost always in a whining tone of voice – hundreds and hundreds of times during my business career and in my personal life. I’ve heard it from countless sales professionals griping about their increased quotas. I’ve heard it from teachers. I’ve heard it from it from government employees of all stripes. I’ve heard it from medical and all sorts of other professionals. Anyone, including you, who cannot do more with less month after month after month, year after year after year, should be ashamed of themselves and summarily fired! Thinking maybe that’s too harsh a judgement??? Consider this: Since the dawn of humanity, humans have actually been doing more with less. It’s what we humans do. (Except of course for the stupid/ignorant/lazy among us.) It’s called progress. It’s all about making life just a little bit better, for ourselves, for our loved ones, for our communities, ultimately for all of us. Let’s look at a few examples. In 1776, it took roughly 97% of the American population to produce enough food to feed everybody. Today, it takes less than 1% of the American population to feed not only the U.S., but a goodly chunk of the rest of the world. Not only that, nearly three-quarters of American men and more than 60% of women are obese or overweight. The UN estimates that about 700 million people globally are malnourished, and that 1 billion are overweight. Seriously! There are now more overweight people than underweight people – world-wide! Farmers have consistently been doing much, much more with much, much less for hundreds of years. In 1947, 30% of Americans were employed in manufacturing jobs producing an inflation adjusted $2 trillion worth of stuff. Today, about 10% of Americans make over $6 trillion worth of stuff. That would be 3 times as much accomplished with 1/3 the staff. Manufacturers have consistently been doing much, much more with much, much less for hundreds of years. When you had your first child – or 2nd or 3rd or whatever number for that matter – were you and your spouse really up to the task? Did have enough money, time and the host of other resources necessary to care for a child? No, of course you didn’t. But you figured it out, didn’t you? Somehow you made it work. Even if it was twins or triplets! New parents have consistently been doing much, much more with much, much less for thousands of years! I could go on and on with the examples, but I think you get the point. 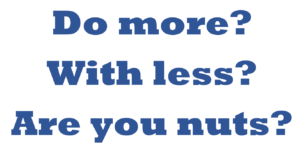 If you’re not constantly and consistently figuring out how to do more with less – you are contributing exactly nothing – zero – zip – nada – to enhance your own well-being or that of anyone else.